Google's dream of bringing balloon-powered internet to billions around the world without connectivity is a 'waste of time' according to legendary balloonist and engineer Per Lindstrand. The Swede, whose attempts to fly around the world with Sir Richard Branson brought worldwide notoriety, poured scorn on the Project Moon plan to send thousands of Wi-Fi enabled balloons into the stratosphere. When asked could the latest Google X Labs 'moonshot' possibly work, Lindstrand emphatically told TechRadar "No." He added: "I talked to them [Google] about it. I told them it was a waste of time, but they didn't listen." Lindstrand is unconvinced by Google's claims that it can keep a constant stream of balloons travelling around the earth to ensure constant connectivity, with each balloon staying airborne for 100 days at a time. 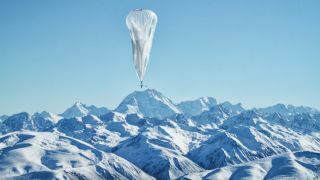 The company says by steering the balloons in and out of high altitude stratospheric winds it can control their direction, while the self-aware balloons would flock like birds and ensure they stay far enough apart to maintain constant connectivity on the ground. Lindstrand, who suggested Google use stationary airships instead, said: "Balloons blow away. Wind speeds at that altitude can reach up to 120 knots, so they won't stay there for more than a minute. "Normally a helium balloon at altitude can only stay up for 3-4 days, and if you set off a lot of balloons simultaneously around the world, sooner or later they're just going to collect at the North Pole or the South Pole. They can't stay in position." You can read more of Lindstrand's exclusive comments in our Project Loon explained feature.